Air BnB may seem less expensive until you're hit with their cleaning fees, etc. AND - we prepare a great breakfast for you every morning. There's lots of things to do in the Finger Lakes year round. Check out the Finger Lakes Tourism Alliance Calendar of Events to see what's happening. We're a vegan oasis, nestled on 15 acres a few miles northwest of Watkins Glen, NY. 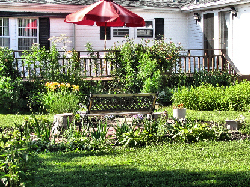 The Ginger Cat B&B is the perfect place to stay during your vacation in the Finger Lakes. Our driveway is large enough to accomodate trailers if you're coming to take part in a race at WGI! Our philosophy is simple: Treat our guests as friends. Provide clean and comfortable accommodations, serve great food and be as helpful as possible. We don't have an 1800s farmhouse or lots of antiques, but we do have peace and quiet and did we mention really tasty vegan food? Enjoy your breakfast on the 4-season porch, watch the magnificent sunsets and stargaze (the Milky Way is directly overhead!) from the large deck or take a walk through the woods that surround the house and gardens. Despite our rural surroundings, we are less than 15 minutes to Farm Sanctuary and Watkins Glen State Park and 5 minutes to the Seneca Lake Wine Trail. Corning and Ithaca are within 45 minutes. 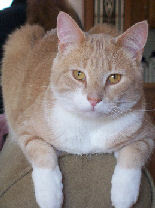 If you need some feline loving, one of our resident cats will be happy to accommodate your needs. 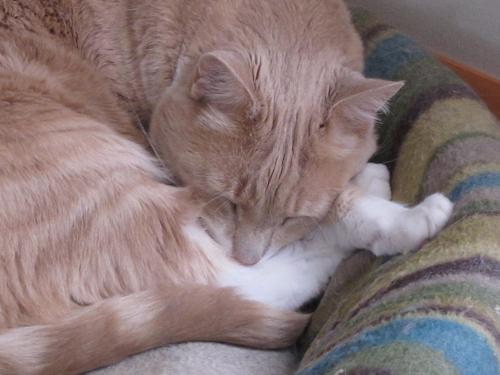 We do not allow the cats into the guest quarters to reduce the chance of allergic reactions. We are open year round. Pet friendly! Photo Gallery and Guest reviews! The Ginger Cat B&B recognizes the importance of ensuring that our website is accessible to those with disabilities. This website endeavors to conform to Web Content Accessibility Guidelines and has been built using code compliant with W3C standards for HTML and CSS. The site displays correctly in current browsers and using standards compliant HTML/CSS code means any future browsers will also display it correctly.